Marcus Rashford's first half strike secured Manchester United a 1-0 derby victory over bitter rivals Manchester City at the Etihad, putting the Red Devils within a point of fourth spot in the Premier League and leaving City's title charge in tatters. Manchester United breathed new life into their push for a top four finish while simultaneously crippling Manchester City's title charge, as Marcus Rashford's first half strike gave Louis van Gaal's side a 1-0 derby win at the Etihad stadium. 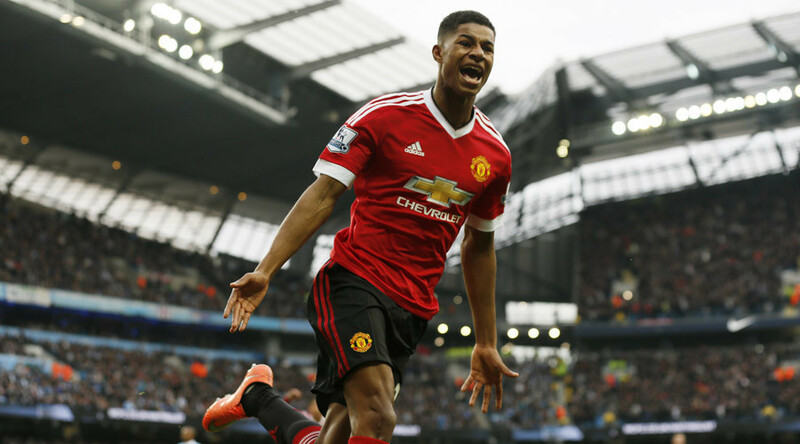 Rashford, who scored twice on his full Premier League debut against Arsenal last month, was a danger throughout and struck after skipping past City defender Martin Demichelis before coolly slotting past Joe Hart after 16 minutes. Victory takes United up to 50 points, level with West Ham in fifth place, and just a single point behind City in the final Champions League spot. With leaders Leicester beating Crystal Palace on Saturday, defeat for City leaves them 15 points adrift of top spot with eight games to play. Their hopes of a third Premier League title are all but over despite having a game in hand over the Foxes. Manuel Pelegrini's side asked plenty of questions of United at the Etihad, especially in the second half. Sergio Aguero was chief tormenter, hitting the post with a near post header and generally terrorizing the United backline with his aggressive running and powerful shooting. The Argentine looked destined to score as City piled forward in search of an equalizer, but the United defense withstood wave after wave of attacks, with both Chris Smalling and Daley Blind excelling. City managed 26 shots on goal compared to United's five but were unable to make their dominance count. City were forced into a change in the first few minutes of the second half after Joe Hart was injured clearing the danger under pressure from Anthony Martial, with beleaguered Demichelis at fault for putting his keeper in trouble with a sloppy back pass. It was a day to forget for Demichelis, with the Argentine also lucky not to have conceded a penalty at the end of the first half after upending the lively Rashford just inside the box. Hart's replacement, Willy Caballero, had little to do as City poured forward, but his side failed to engineer a breakthrough and are now firmly out of the title race. For United, victory over their Manchester neighbors was the perfect response to Thursday's Europa League defeat to Liverpool, with the three crucial points taking them that bit closer to securing fourth spot. Demichelis looks very fortunate not to give away a penalty. "If United do not sign the final contract [with Mourinho] before 1 May, they must pay $7m; if by 1 June he’s still not signed, they shall pay another $14m. May is the key, because it’s the month in which the vast majority of the signings of players are closed and the plans formed." United seem to be planning for a future without Louis van Gaal regardless of whether United qualify for the Champions League this season. Given the embarrassment suffered in Europe and in the league, the United hierarchy seems to be confident that it is time to make a change, as finishing fourth in the league would still constitute a failure for United this season. For City, the season keeps getting worse and worse. They are now in danger of finishing out of the Champions league spots, which would be a great source of embarrassment for the club and a unique challenge for the incoming manager Pep Guardiola. The club has been hit with injuries to key players at a crucial juncture of the season, and there has been constant media speculation on whether City's announcement of Guardiola's signing has undermined the current manager Pellegrini. In fact, City's slump has been far more pronounced and longer lasting than apparent - after a five-game winning streak at the start of the season, City's form has been dire - since September 23 the club has earned fewer points in the league than both United and Chelsea (a club nine points behind in the league), and the blame for it falls on both the manager and the players. Whether City plays in the Europa League or the Champions League next season, Guardiola will need to oversee a massive overhaul in the playing squad. Across the city, so will LvG or Mourinho, or whoever is in charge at United next season.